The Alliance for Aviation Across America has released a scathing review of JetBlue's latest "Welcome Bigwigs" ad campaign, which consists of a website and some allegedly funny videos. The point of the campaign is to convince CEOs to park their business jets and fly commercial on JetBlue. While that idea might have looked great in the Dog and Pony Show that JetBlue's marketing people whipped up, this campaign misses the mark on many levels. In the first video, "Welcome Aboard", the CEO-type announcer tells you that you can pay way, way, way, WAY less flying JetBlue, and that the airline can "get you to many cities where you already own homes or hide money." Following that is the same CEO telling you Jet Blue "even flies to the secret hidden headquarters of the Illumanati, where CEOs like us manipulate the shadow government that secretly rules the world." What is THAT all about? In video #2, "The Airport", the story continues at Terminal 5 at JFK. A CEO named "Carl" looks embarrassed to be seen among what the video calls "regular" people. When he successfully gets his boarding pass out of the ticket kiosk, the announce reminds us that the exercise is "easier than writing off a toxic asset." But that is nothing...when "Carl" goes through security, we see him look around cautiously before pulling out several bundles of cash...from his PANTS. Really classy. As "Carl" the CEO finds his coach seat, the announcer reminds us that like the executive business jet that "Carl" has parked, every seat in a JetBlue plane is...LEATHER. And we find out each seat has its own private entertainment center...just like that "other' jet. But as "Carl" is watching the small screen, up pops a news report showing "Carl" doing the traditional "perp walk" – shielding his face from TV crews – with the TV announcer saying something about him embezzling $48 billion from his company's retirement fund. This video ends with the nice announcer saying JetBlue is "the next best thing to private air travel"...and that you might as well go ahead and sell that old private jet on Craigslist. By now, you are thinking this has to be a Saturday Night Live skit, some kind of put on. But no, this is a real JetBlue website. I'm not sure what they are trying to accomplish here, but I can guarantee this campaign will not convince any CEO to fly JetBlue. After the demeaning whipping this campaign gives to these "CEOs", if they do end up flying commercial, you can bet they will do everything in their power to fly any airline BUT JetBlue. The Alliance for Aviation Across America today launched a print ad in response to JetBlue’s most recent ad gimmick that ridicules the nation’s business executives who use business aviation and attempts to argue that traveling on JetBlue is a better option to general aviation. However, the Alliance ad highlights JetBlue’s glaring omission: that JetBlue only serves 44 big city airports around the country mostly on the East and West coasts, and general aviation, by contrast, serves 5,000 communities around the country. Well said. I predict this campaign will backfire big time. 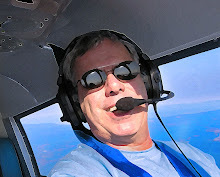 And while it feels great to pile on business executives these days, it is unconscionable to suggest everyone that flies on general aviation private aircraft are sick, unethical, morally-bankrupt creeps. 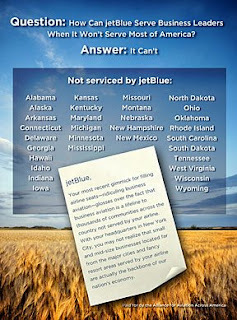 I have always been a big supporter of JetBlue, but no more. These videos are a joke, a stab in the back of anyone who supports GA. If you want to help the Alliance fight garbage like this, your first stop is their web site. I Can Now Legally Fly Through Clouds! 'In Your Face' Never Looked So Good!